We approach the field of the paranormal with a commonsense, open-minded attitude and a level-headed, logical method of investigation. We always look first for natural reasons for reported supernatural or paranormal phenomena. And even when those possibilities have been systematically eliminated, we still do not rush to conclude that what remains is paranormal; it can always just be something normal that we have failed to identify. We do not claim to be paranormal professionals or experts. (If someone does, be wary!) Many of our team members are professionals in their careers, but our involvement in the paranormal field is due to personal interest in unexplained phenomena. We are open minded and good listeners. We seek explanations for the unknown events that can and do touch and affect many people's lives. We do not hold a fixed position on any paranormal phenomena; we are prepared to change our views when presented with new ideas backed by good evidence. Nothing is certain or absolute in the field of paranormal investigation and research, nobody has all the answers, and we are still very much on the lower rungs of the ladder of understanding what might be going on. If anyone tells you something like, 'Your house is definitely haunted', take what they say with a grain of salt. They may be sure in their own mind but the evidence to support their claim might not be so strong. We're not 'Ghost Busters' and we don't go 'ghost hunting'. Also, we are not in the business of removing ghosts from places, emancipating spirits, etc, (we prefer to study them!) but we are able to put you in contact with people who perform services such as cleansing properties and releasing or emancipating spirits. Please read our disclaimer. "It is possible that there exist emanations that are still unknown to us. Do you remember how electrical currents and unseen waves were laughed at? The knowledge about man is still in its infancy." 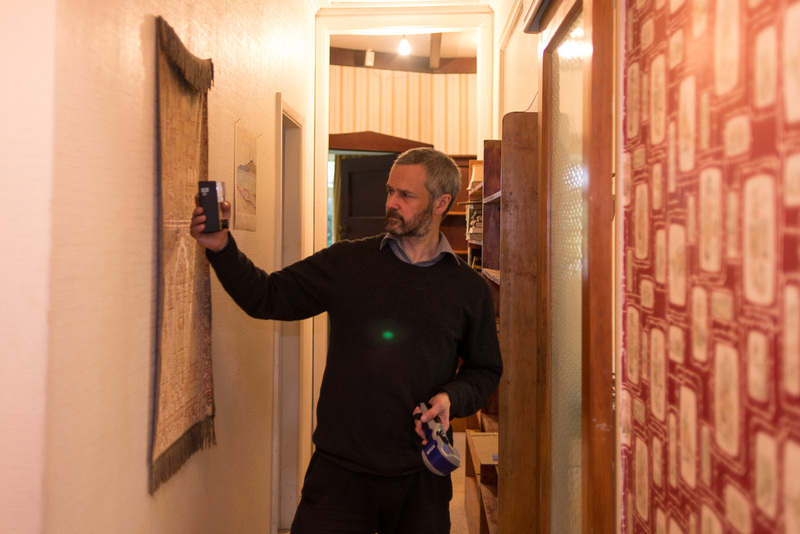 James Gilberd investigating a site in Palmerston North. 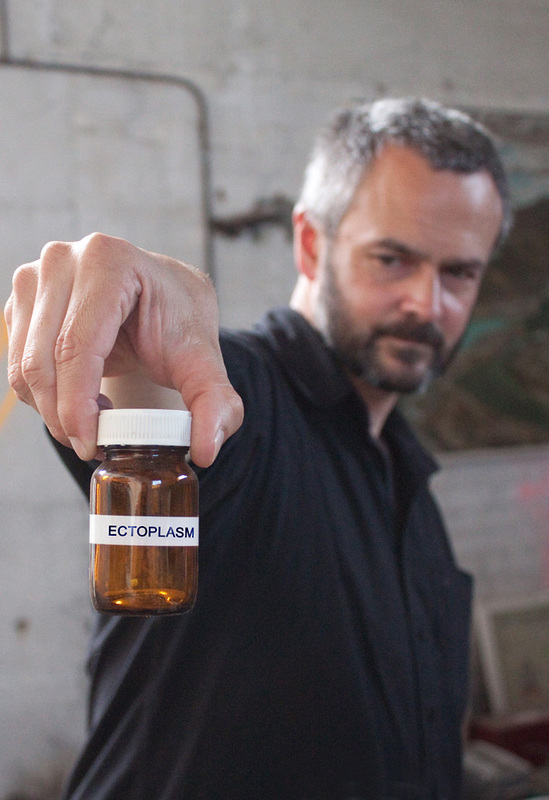 Photo: Mark Faamaoni, Photoshop work: Denise Durkin - the Ectoplasm label originally said Mercury. "Sit down before fact as a little child, be prepared to give up every preconceived notion, follow humbly wherever and to whatever abysses nature leads, or you shall learn nothing."